It is so good to weave this sample after the last sample because we bring over those colour and weave effects from Log Cabin and pour them into Weft Faced plain weave. They are definitely connected. We do branch out into twill and other tie-ups and we master the ideas around weaving on opposites. Oh my goodness, I love Log Cabin sooooooooo much. Log Cabin can be inserted into any existing graphic that you have. Imagine if we took some of the samples from last season, like Parrot for instance and we overlaid Log Cabin on top of that graphic. Or what if we built Log Cabin into our Plaid graphic, or what if we brought those repetitive sequences that we learned in the Colour & Weave Gamp and overlaid them on top of our Log Cabin……what if, what if, what if…..those 2 little words have driven my study of simple patterning for decades. we learn how to splice our tails when we tuck them at the selvedge……and so much more. 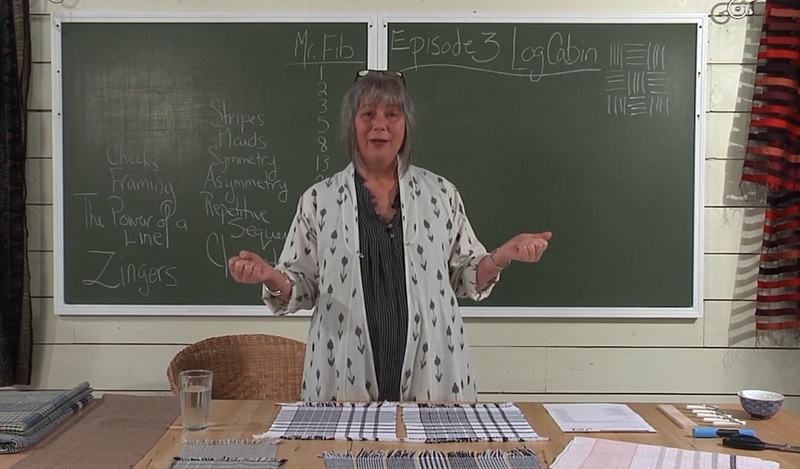 Best of all, we get to spend one more episode learning that plain weave is anything but plain. It is PW 2, Perfectly Wonderful Plain Weave. In this first sample for Season 3 we are using our reed to create a wonderful lacy looking fabric in plain weave. 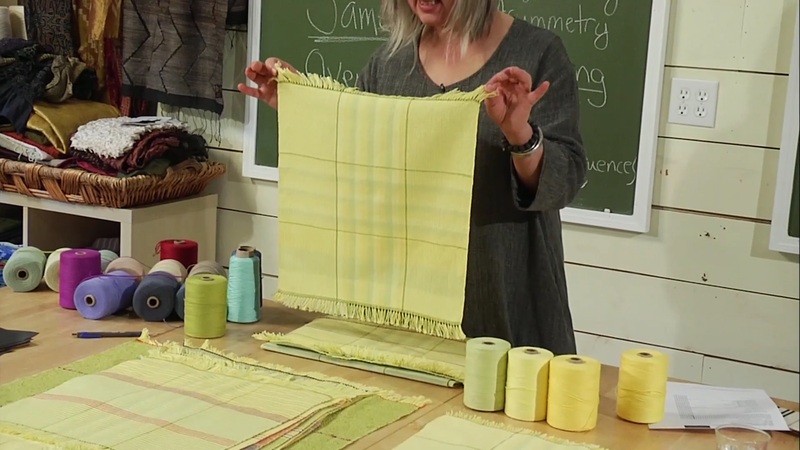 In this lesson I use 16/2 cotton for the weft on one scarf and 30/2 silk on the second one. This certainly adds another layer of luxuriousness. We’ve learned so much this year with Colour & Design! 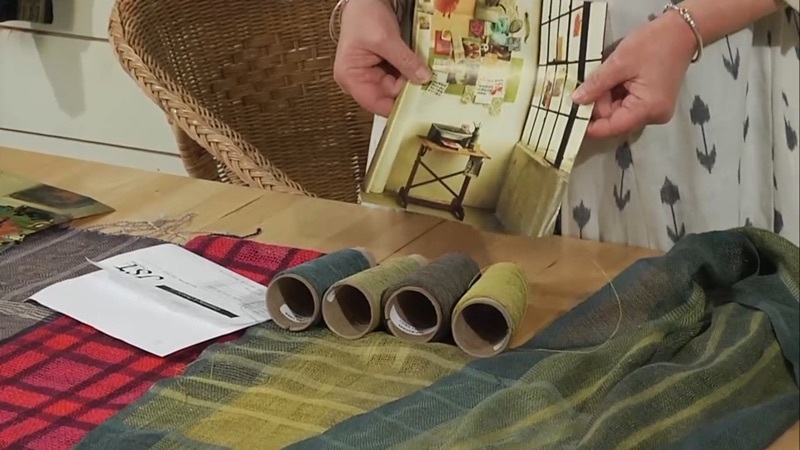 We’ve woven 7 samples filled with colours, graphics & architecture. We talked more about sett. We learned how to change our warp by taking out zingers and replacing them, opening our sett without re-beaming our warp to create different fabrics, adding texture to our cloth, bringing in yarns from our stash, weaving clasped weft and overlaying one sample on top of another. It’s time to put it all together in this episode and review everything we have learned and woven. we have been developing our technique to control our beater throughout this whole workshop and now we will use this control to weave twill and plain weave at the same sett. We are in for a treat this month because our wonderful friend, neighbour and Tuesday Girl….Joan Carrigan is going to share a bit of her world with us. 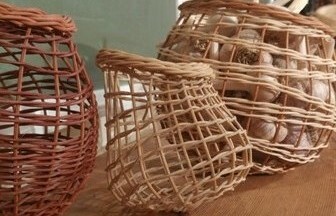 Joan is a full-time basket maker and basketry teacher who has lived on Salt Spring Island, BC for over 20 years. 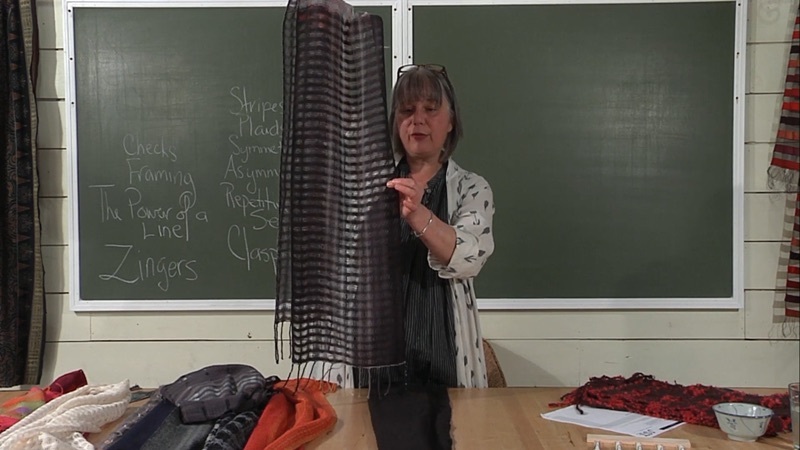 Joan studied Fine Art and Art History at the University of Guelph and attended her first Basketry Conference in Toronto in 1991. Since then, her passion for this ancient art form has led her to study, travel, and explore many different techniques and materials. Her research into traditional skills inspires her to use plant materials she respectfully harvests from nature, while her background in fine art fuels her enthusiasm for the sculptural and creative potential that the medium offers. Joan’s work has been exhibited nationally and internationally. She has received two Project Grants from the Canadian Council of the Arts and she is a recipient of two Handweaver Guild of America Awards. In this episode, Joan teaches us how to make your own garlic basket & festive star for your home or as a gift to give away in a few months. I love stripes… fat ones, skinny ones… fat stripes with skinny stripes on them… there’s so much to do with stripes. The stripe has an ancient textile history but hasn’t always been loved. For much of history the stripe was used to label you an outcast of some sort a leper, a prisoner, a prostitute to name just a few. Stripes had to wait for modern times to be seen as loveable. Plaids have been identified in archeological digs dating back 3000 years. 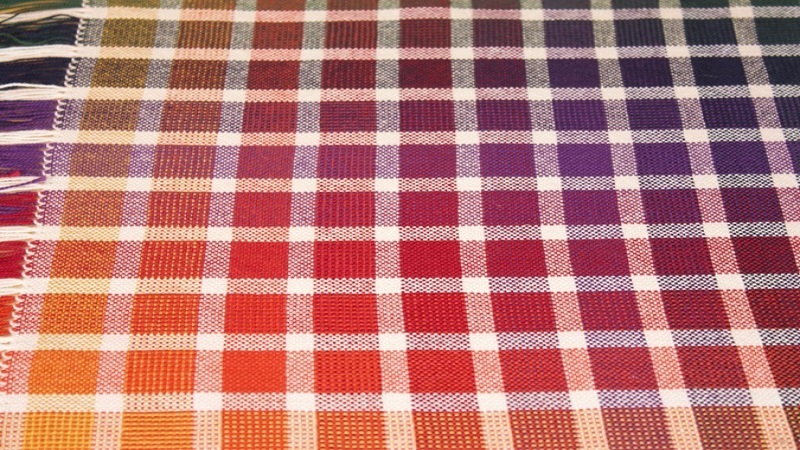 In Scotland a plaid is a length of woolen cloth slung over the shoulder that can be used as a blanket. 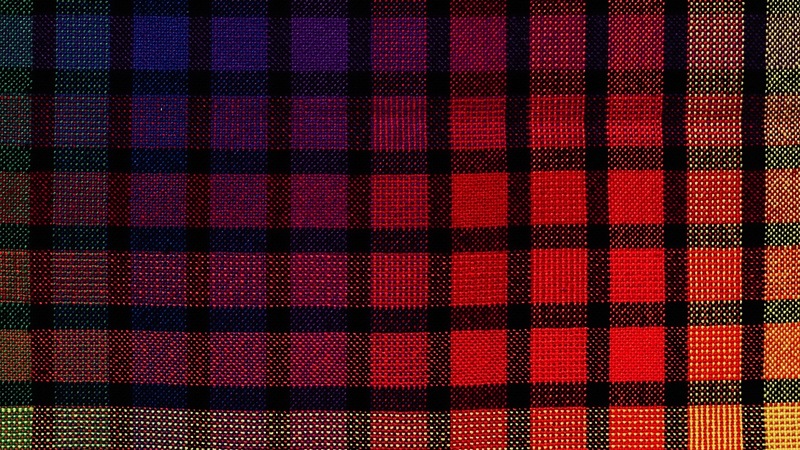 It is usually called a tartan but in North America we use the word plaid to describe a fabric woven in plain weave or twill made of of stripes and squares. In India these types of patterns are woven in cloth in plain weave and are called Madras. 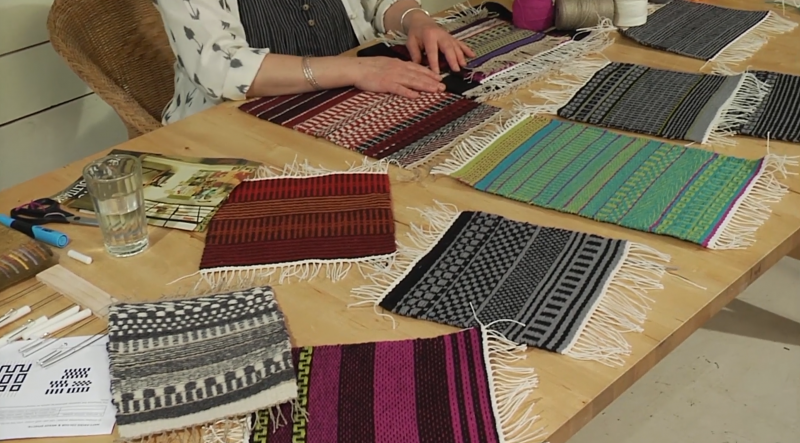 We are weaving this simple pattern made up of two different sized squares with a striping sequence in a very traditional layout. 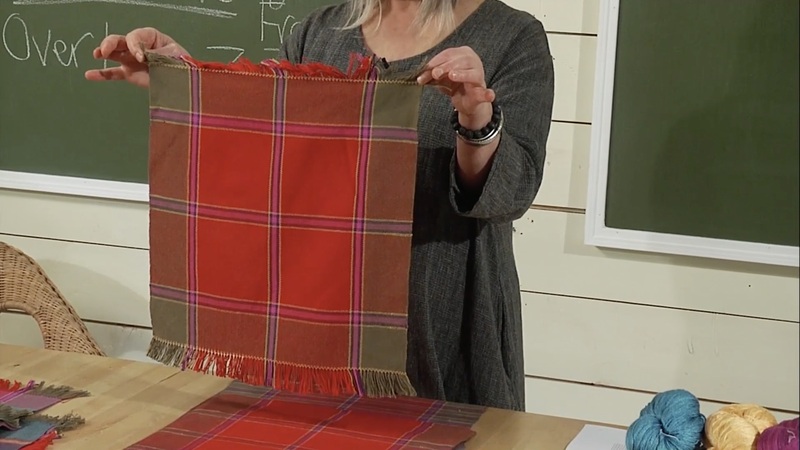 When you watch episode 6 you will start out in a very traditional way playing with the squares and the stripes but by the time we finish you won’t even recognize this warp as having anything remotely to do with traditional tartan or plaid. values… one in the warp… one in the weft.